Starting again in a foreign country that speaks an unfamiliar language is tough. Doing so as the mother of five young girls is even tougher. That’s the challenge Balgeis faced. Her husband, Salim, was starting a PHd. at the University of Dundee which meant uprooting the family from their home in Benghazi, Libya. Balgeis was excited, but understandably apprehensive. A classic case of fear of the unknown. She’d experienced Europe while visiting with her father on business trips, but she’d never been to Scotland. For Balgeis, this was an opportunity to give her daughters the best possible start in life – an opportunity to have an education that will set them up for the future. Balgeis heard about Dundee International Women’s Centre (DIWC) through a friend of her husband’s. I was told that DIWC was very good and that I’d get the chance to learn and meet new people at the centre. It was more than I expected. I felt very welcome. Speaking to Balgeis today, it’s hard to imagine that seven years ago, she spoke no English. She grew up in Libya at a time when relations between the West and her homeland were at an all-time low. All reference to the West was cut out of the Libyan school curriculum, including learning English. English books were burned as the US and the UK tightened sanctions as a result of the Lockerbie tragedy. The politics and conflict cost a complete generation the opportunity to develop their English speaking skills. Taking the English for Speakers of Other Languages (ESOL) course was the crucial first step on her journey. It was hard, but she was a determined student. With her new found English skills, Balgeis embraced the opportunities. She enrolled in a number of different classes. She got creative with art, got practical skills in sewing class and she learned new cooking and baking skills. Although, it’s fair to say that, when it comes to culinary skills, Balgeis is as much a teacher as she is a student. 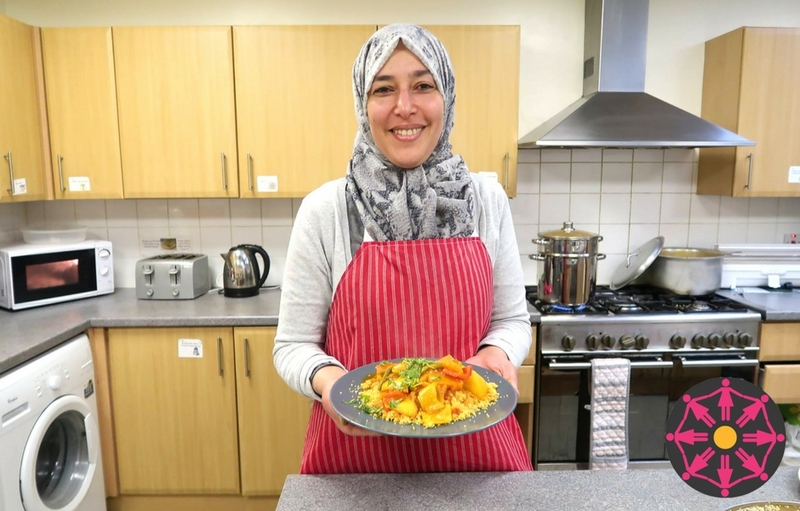 She’s shared with the women of DIWC the wonders of traditional Libyan and north African cooking. It’s a sign of Balgeis’s character that she wasn’t satisfied with her English skills. She wanted to take them to the next level. Taking the English for Life class gave Balgeis the opportunity to improve her English skills by building on her ESOL qualification. It also gave her the opportunity to help more people, which is such a core part of what motivates her. She demonstrated this, when after two years as a user of the Centre, she asked if she could become a volunteer at DIWC. As a volunteer Balgeis has helped women, just like her, find their feet in Dundee. Women, who, due to circumstances beyond their control, have found themselves alone and isolated in a country whose language they can’t understand, let alone speak. She helps these women settle in the city by sharing advice based on her own experiences. Her English speaking skills have developed so well that she now acts as translator for many Arabic speaking women. And it’s not just translating from English to Arabic, by virtue of her Syrian mother, she’s ideally placed to help translate from Syrian Arabic to other variants of Arabic. She’s used this to help a number of Syrian refugees access the services they need to settle in the area. That might mean helping them understand letters from the council, schools, utility companies or doctors. It can even be helping them understand and select the right mobile phone tariff – something that’s challenging enough for people that speak English. She’s become a prominent figure in the Arab community, and that extends beyond Dundee. Each Saturday morning she travels to Edinburgh as a volunteer to teach English and maths to children and young adults. All the while, she encourages them to retain their Arabic speaking skills. Balgies is passionate about this point. For her, learning English and embracing the culture of the country you live in is important, but it shouldn’t be at the cost of their own heritage. For the young especially, having both English and Arabic language skills gives them something that Balgeis and many of her generation didn’t have – choice. If they want to return to the country of their birth, they need to have command of Arabic. Balgeis is an inspirational woman with a warm and welcoming personality. She’s given so much to the Arab community since arriving here for the very first time. Balgeis’s focus now and for the future is to simply help more people in any way she can. She thrives on it. It’s her mission. And, we’re delighted that she remains committed to DIWC. She adds so much to what we at the centre. We asked Balgeis what her experience at DIWC has given to her. She paused and thought about it for a long time, and then, she summed it up in one word – “confidence”. And, that confidence is something she wants more women to enjoy, especially her 5 daughters. Balgeis she is such a helpful woman not only in Dundee but also every where. She is always happy to offer her help to all people around her . Well done Belquis. You are a credit to the libyan community.